Glenn Lindgren: Yuca is another one of the root vegetables that are staples in Cuba. Jorge Castillo: We especially like to eat it at parties and at holiday gatherings like Christmas Eve. Raúl Musibay: Be sure to remove any "woody" parts from center of the yuca. Yuca is another one of the root vegetables that are staples in Cuba. It's a mainstay dish at parties and at holiday gatherings such as Christmas Eve. Place yuca in a saucepan; add water until yuca is just covered. Add salt and lime juice, and bring to a boil. Reduce heat, cover, and simmer until tender -- about 30 minutes. Drain. Remove the "woody" or fibrous core from the center of the yuca. Mash garlic cloves into salt with mortar and pestle. 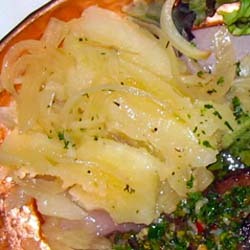 Add garlic, lemon juice, and onions to olive oil in a separate saucepan, heat until bubbling, and then pour over yuca. Toss the yuca and all ingredients lightly while continuing to sauté over medium heat until barely browned, but not crisp!